VR's next big player has Oculus DNA and augmented reality ambitions. 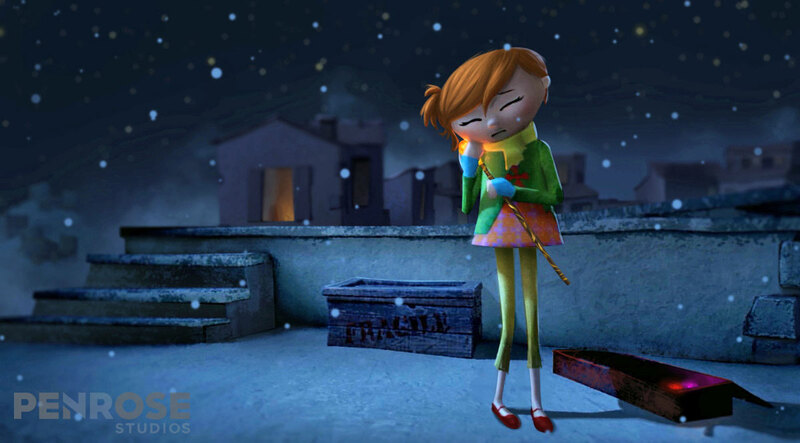 Loosely based on Hans Christian Andersen's The Little Match Girl, Allumette, the latest virtual reality short to come from Penrose Studios, isn't some Disney-fied experience for children. Though set in a whimsical, cloud-borne city and populated by charming and mute marionette-like denizens, the short -- named after the French word for "match" -- is actually a surprisingly mature allegory about love, loss and the sacrifices parents make for their children. It's but one piece of a greater interactive virtual world Penrose is creating. "Our initial idea is that it's not just Allumette; it's about her town," says Penrose studio founder, Eugene Chung. "It's about this big, expansive space. ... And that's actually part of what's coming." The 20-minute experience, which follows the titular character to her eventual demise, hews closely to the studio's recent tradition of mining inspiration from literature's past. 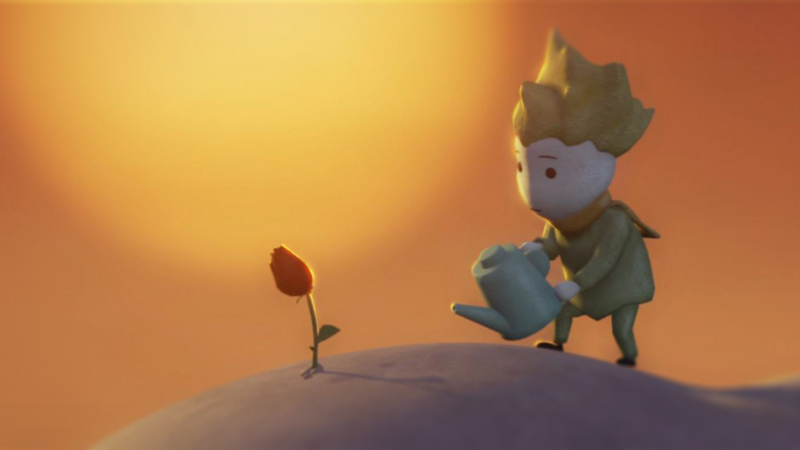 For its first VR short, The Rose and I, the San Francisco-based studio lifted elements from The Little Prince. But a reinterpretation of classic short stories isn't quite Penrose's aim. Those truncated tales simply fit the bite-sized, serialized format of current VR experiences. In fact, the small studio -- which is made up of Oculus VR, Dreamworks and Pixar veterans, among others -- is intent on building "persistent worlds" that viewers can revisit to eavesdrop on the drama of inhabitants. It's a way for Penrose to successively build out a story's larger narrative in VR. It's also a clever content play. The little prince of Penrose Studios' first VR project, The Rose and I. "We definitely have other projects in the pipeline that [are] not living in Allumette's world," says Chung. "But we definitely think of Allumette's world as a much bigger thing; a much bigger platform to do a lot more." While the Tribeca Film Festival in New York serves as Allumette's official long-form premiere -- prior to this, it'd been demo-ed in preview form -- work on the project is still underway. Chung was able to demo only a portion of its planned interactivity, which puts the "matchstick" (via the Oculus Rift or HTC Vive controllers), in the viewer's hand as a sort of torchlight with which to explore the town and light up nearby clouds. That said, a preview version, Allumette - Chapter 1, will be released "in coming days" to Steam VR and the Oculus storefront as a free limited-time preview. Its final 20-minute festival form, however, won't be made available until later this year. A version for PlayStation VR is also on deck. "We definitely think of Allumette's world as a much bigger thing; a much bigger platform to do a lot more." WIth its Tribeca debut barely under Penrose's belt, already the studio is considering ways to expand upon Allumette's world of "Wake," a codename that pays homage to James Joyce's novel Finnegans Wake. "The way we categorize our projects internally is by worlds, [rather] than by stories within those worlds," says Chung. The idea behind this thinking is that it'll allow Penrose to get VR viewers familiar with its characters and worlds, and then invite them back to experience new installments featuring characters old and new. The floating world of Allumette's cloud city. It also doesn't hurt that this approach builds upon existing assets -- much of which were created within VR -- and dispenses with the time-intensive effort of creating entirely new worlds and engines from scratch each time. Of the five planned "worlds" on Penrose's slate, Allumette's world of Wake counts as the third. The studio's next project will focus on world five, the details of which Chung wouldn't reveal except to say it'd stray from the classic short story format. 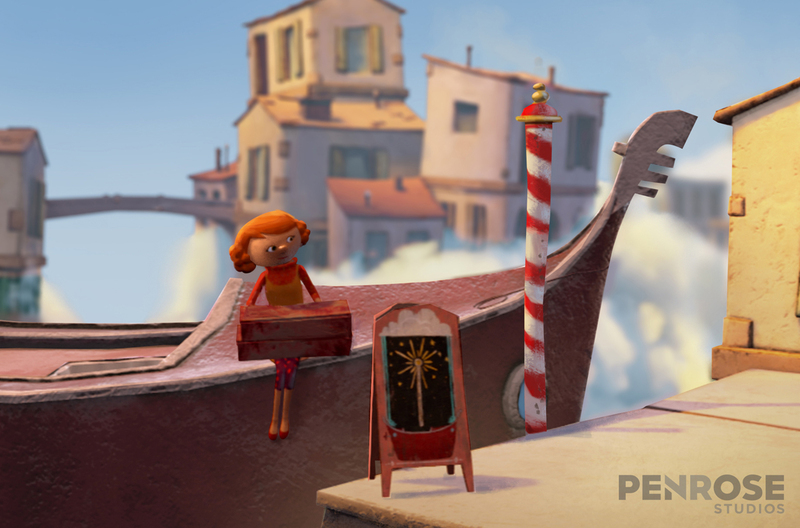 It's not by accident that Penrose parallels Oculus VR's own animated VR storytelling studio. Chung, who previously worked in venture capital, and as a producer at Pixar before that, most recently hails from Oculus VR. In 2014, after an enthusiastic visit to the company's headquarters for a VR demo, Chung was asked to join in the newly created role of head of film and media. That role led to the creation of Story Studio, the company's in-house animation department. There, with a cherry-picked group of eager animators, artists, programmers and developers, Chung set the vision for Story Studio and executive produced its first VR short, Lost, which debuted at the Sundance Film Festival. The Oculus stint, however, was short-lived, as Chung departed a year later to form Penrose. Despite the studio's current public focus on VR, Chung's ambitions for Penrose extend beyond the medium. Its recent round of seed funding, totaling $8.5 million, is proof. He prefers to describe the studio as more of a "tech company" than VR animation house. And rightly so, as augmented reality is listed as one of the studio's main areas of focus. It's still early days for those in-development holographic projects, and Chung isn't willing to discuss specifics, but he does highlight proprietary VR creation tools similar to the ones used to create Allumette, and extensions of existing VR projects as possibilities. "Some of the next things you're going to see from us are going to be quite a bit different," he says. With a bit of planning, you won't have to leave the couch all day.